So a series of tweets resulted. @Greg_Carey @sarahmccammon @skestenbaum @deanbaquet @splate1 @ctschroeder I actually think it’s surprisingly simple and easy to understand. 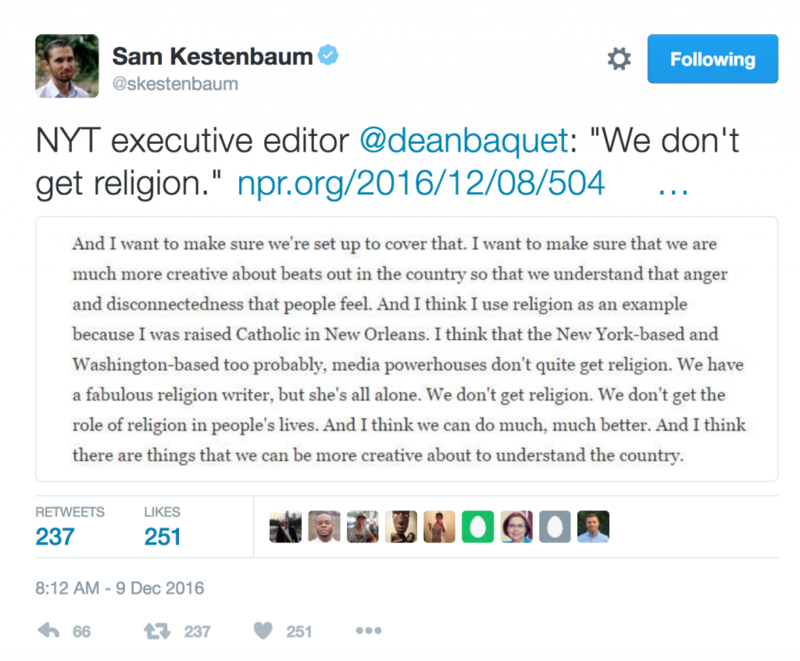 @sarahmccammon That we even think a part of the social is somehow identified as religious is the interesting move here. Cont. @sarahmccammon There’s much actors gain, of course, from portraying part of the social as somehow unique, set apart, more significant. Cont. @sarahmccammon Esp. those that conflict. So saying it’s all about rel might miss the point. Maybe it’s all about what counts as religion. But flipping things around in this way calls much of how we navigate daily life into question (hence the lack of retweets or comments, perhaps) and so my bet is that there’s too much at stake to take classification seriously. Instead, we’ll likely just keep scratching our heads over how to better understand, say, the religious motivations for how people vote or shop, confident that there’s a pure realm of belief and experience that, as William James once told us, gets complicated in the messy give and take of social life. But if some reporters are game to do this sort of rethinking, then I bet there’s plenty of trained specialists who would enjoy having a chat — not a soundbite chat but something a little more meaty. For it’s not always easy to understand the simple things, since we usually overlook them since they are, well…, just so simple. This entry was posted in Faculty Blog, Relevance of Humanities, Religion in Culture and tagged Belief, Classification, Experience, National Public Radio, New York Times, Religion, Twitter, William James by Russell McCutcheon. Bookmark the permalink.